Weird Wonderful Web: Sewer Aliens in North Carolina! Sewer Aliens in North Carolina! 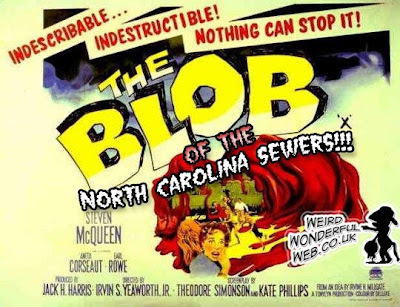 The BLOB of the North Carolina sewers! Yes folks aliens! Unknown beings! Well okay, maybe not. Here is a video posted on YouTube on 30 June 2009 called "Unknown Lifeform in North Carolina Sewer!" Filmed by construction firm Malphrus Construction using a "snake camera". Malphrus Construction were hired to inspect the sewer, built in 1949, to check for damage to the infrastructure, when their camera happened upon these pulsating slimy sacs. You clearly see them shy away from the light attached to the camera. Early iPod prototype still in use!